Oh Internet, you are so full of conflicting stories. One article says that Vienna Coffee and Salted Caramel Chocolate Chip were coming out for July 2016. Another says SCCC debuted just this October. 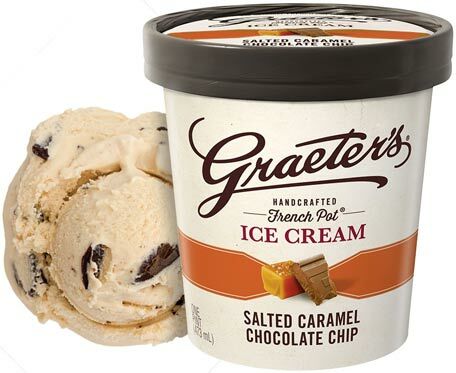 There is no official press release on the Graeter's website for either flavor but the flavor list does show SCCC as new, so let's go with that. What they've done is taken their amazing Salted Caramel ice cream (review here) and added in their infamous chocolate chips. If that sounds cool to you, go find a pint. Other new flavors this year include the wide release of Cheese Crown (review here) as well as several very limited editions for the summer. The lineup with approximate release dates includes Orange & Cream (5/16), Mexican Chocolate (5/29, announcement here), Banana Chocolate Chip (6/13), S'mores (6/30), Chocolate Hazelnut (7/11), Bavarian Almond (7/27), and Butterscotch Crunch (8/22).